The Fischer family has been making wine in the town of Rossatz in the Wachau valley on the right bank of the Danube River since 1898. 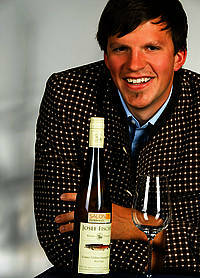 Recently, Josef Fischer, Jr. has replaced his father, becoming the 5th generation winemaker of the family estate. A rising star of the Wachau, Joe studied winemaking at the renowned school in Klosterneuberg before travelling to New Zealand, Australia and South Africa to learn differenent vinification styles and methods. In his five vineyards, Joe practices integrated agriculture, protecting animals and seeding beneficial plants to increase the soil’s nutrients. All the grapes are hand harvested. Entrusting his son to take over the winemaking, and bring it to a new level of excellence, Josef “Pepi” Sr. is now devoting his time to his great passion for raising Huchen, a nearly extinct great fish of the Danube. His great respect for nature and the sustainability of this fish inspired the wine labels.